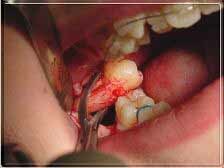 A dental extraction is the surgical removal of a tooth from the mouth. Simple extractions may be done by a dentist or oral surgeon, and are performed on teeth that are visible in the mouth, usually under local anesthetic. Typically the tooth is dislocated using an elevator, and subsequently using forceps, rocks the tooth back and forth until it is loosened from the alveolar bone. Surgical extractions involve the removal of teeth that cannot be easily accessed, either because it has broken under the gum line or because it has not come in yet. In a surgical extraction the dentist makes an incision in the gum to reach the tooth and may also require the removal of overlying bone tissue with a drill or osteotome. After the tooth is removed, a clot will usually form in the socket. Historically, dental extractions have been used to treat a variety of illnesses, as well as a method of torture to obtain forced confessions. Before the discovery of antibiotics, chronic tooth infections were often linked to a variety of health problems, and therefore removal of a diseased tooth was a common treatment for various medical conditions. Instruments used for dental extractions date back several centuries. In the 14th century, Guy de Chauliac invented the dental pelican, which was used through the late 18th century. The pelican was replaced by the dental key which, in turn, was replaced by modern forceps in the 20th century. As dental extractions can vary tremendously in difficulty, depending on the patient and the tooth, a wide variety of instruments exist to address specific situations. An extracted 3rd molar that was horizontally impacted.Extractions are often categorized as "simple" or "surgical". Simple extractions are performed on teeth that are visible in the mouth, usually under local anaesthetic, and require only the use of instruments to elevate and/or grasp the visible portion of the tooth. Typically the tooth is lifted using an elevator, and subsequently using dental forceps, rocked back and forth until the periodontal ligament has been sufficiently broken and the supporting alveolar bone has been adequately widened to make the tooth loose enough to remove. Surgical extractions involve the removal of teeth that cannot be easily accessed, either because they have broken under the gum line or because they have not erupted fully. In a surgical extraction the doctor may elevate the soft tissues covering the tooth and bone and may also remove some of the overlying and/or surrounding bone tissue with a drill or osteotome. Frequently, the tooth may be split into multiple pieces to facilitate its removal. After the tooth is removed, patients are directed to maintain firm pressure on gauze pads for 45 minutes and then remove. If bleeding persists then replace the gauze over wound and bite on it for 30 minutes. Repeat if necessary several times, but if bleeding continues, contact your oral surgeon. To lessen swelling, an ice bag may be applied to the face over the affected area for approximately 24 hours. A towel can be used to wrap around the head, tying the ice packs on the cheeks while also allowing for your hands to not hold them or the ice packs to leave the affected area. The better the area is taken care of for the first few days, the better the recovery overall. Also attempt to keep the head elevated by sleeping on an extra pillow. For moderate pain, Tylenol compound is recommended. However, doctors prescribe medication for severe pain. Doctors tell patients not to rinse their mouth for 24 hours following surgery. After a day, they are told to rinse frequently with 1 teaspoon of salt to a glass of warm water. A clot will usually form in the socket. Occasionally this clot can become dislodged, resulting in a condition called dry socket, also known as alveolar osteitis. This is not uncommon and occurs almost exclusively after extraction of lower molars, due to their lesser blood supply than their maxillary counterparts. Certain factors contribute to its development, such as age, smoking, birth-control, extent of surgery performed to extract the tooth, duration of time the extraction site was surgically exposed, and various others. Dry-socket lengthens the healing process and usually causes severe pain and discomfort that is often not manageable without pain medications. It is treated with a medicated gauze, resorbable gel-foam or surgical packing that is changed (or replaced) every two to three days until granulation tissue can cover the bone at the extraction site. Often these dressings contain eugenol (an essential oil derived from cloves), which alleviates dry-socket pain. After surgery, one should stick to a cool and soft diet since chewing and swallowing may be difficult. Cold ginger ale is good for settling mild nausea. Patients are recommended to call their oral and maxillofacial surgeon's office if they experience problems or have complications. Infection: although rare, it does occur on occasion. The dentist may opt to prescribe antibiotics pre- and/or post-operatively if he/she determines the patient to be at risk. Prolonged bleeding: The dentist has a variety of means at his/her disposal to address bleeding, however, it is important to note that small amounts of blood mixed in the saliva after extractions are normal--even up to 48 hours after extraction. Swelling: Often dictated by the amount of surgery performed to extract a tooth (e.g. surgical insult to the tissues both hard and soft surrounding a tooth). Generally, when a surgical flap must be elevated (i.e. and the periosteum covering the bone is thus injured), minor to moderate swelling will occur. A poorly-cut soft tissue flap, for instance, where the periosteum is torn off rather than cleanly elevated off the underlying bone will often increase such swelling. Similarly, when bone must be removed using a drill, more swelling is likely to occur. Sinus exposure and oral-antral communication: This can occur when extracting upper molars (and in some patients, upper premolars). The maxillary sinus sits right above the roots of maxillary molars and premolars. There is a bony floor of the sinus dividing the tooth socket from the sinus itself. This bone can range from thick to thin from tooth to tooth from patient to patient. In some cases it is absent and the root is in fact in the sinus. At other times, this bone may be removed with the tooth, or may be perforated during surgical extractions. The doctor typically mentions this risk to patients, based on evaluation of radiographs showing the relationship of the tooth to the sinus. It is important to note that the sinus cavity is lined with a membrane called the Sniderian membrane, which may or may not be perforated. If this membrane is exposed after an extraction, but remains intact, a "sinus exposed" has occurred. If the membrane is perforated, however, it is a "sinus communication". These two conditions are treated differently. In the event of a sinus communication, the dentist may decide to let it heal on its own or may need to surgically obtain primary closure--depending on the size of the exposure as well as the likelihood of the patient to heal. In both cases, a resorbable material called "gelfoam" is typically placed in the extraction site to promote clotting and serve as a framework for granulation tissue to accumulate. Patients are typically provided with prescriptions for antibiotics that cover sinus bacterial flora, decongestants, as well as careful instructions to follow during the healing period. Nerve injury: This is primarily an issue with extraction of third molars, however, can technically occur with the extraction of any tooth should the nerve be in close proximity to the surgical site. Two nerves are typically of concern, and are found in duplicate (one left and one right side): 1. the inferior alveolar nerve, which enters the mandible at the mandibular foramen and exits the mandible at the sides of the chin from the mental foramen. This nerve supplies sensation to the lower teeth on the right or left half of the dental arch, as well as sense of touch to the right or left half of the chin and lower lip. 2. The lingual nerve (one right and one left side), which branches off the mandibular branches of the trigeminal nerve and courses just inside the jaw bone, entering the tongue and supplying sense of touch and taste to the right and left half of the anterior 2/3 of the tongue as well as the lingual gingiva (i.e. the gums on the inside surface of the dental arch). Such injuries can occur while lifting teeth (typically the inferior alveolar), but are most commonly caused by inadvertent damage with a surgical drill. Such injuries are rare and are usually temporary, but depending on the type of injury (i.e. Seddon classification: neuropraxia, axonotmesis, & neurotmesis), can be prolonged or even permanent. Displacement of tooth or part of tooth into the maxillary sinus (upper teeth only). In such cases, almost always the tooth or tooth fragment must be retrieved. In some cases, the sinus cavity can be irrigated with saline (antral lavage) and the tooth fragment may be brought back to the site of the opening through which it entered the sinus, and may be retrievable. At other times, a window must be made into the sinus in the canine fossa--a procedure referred to as "Caldwell luc".